February 15, 2017 marks the 75th anniversary of the fall of Singapore during the Second World War. The event was one of the greatest British military defeats in history. It meant the loss of a military stronghold to the Japanese as well as the capture of almost 100,000 men, women, and children as prisoners of war. The event was covered extensively in the newspapers, from the initial invasion and evacuation of civilians to the surrender and questions that immediately followed. 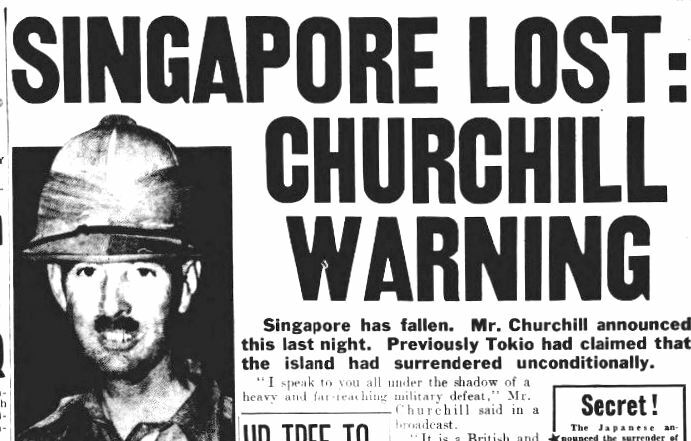 Churchill described the loss of Singapore as ‘a heavy and far-reaching defeat’. Japanese forces landed in Singapore on 7 February. Singapore was a possession of the British Empire and known as the Gibraltar of the East, a gateway to the eastern seas. The speed and vigour of the attack took British forces by surprise. 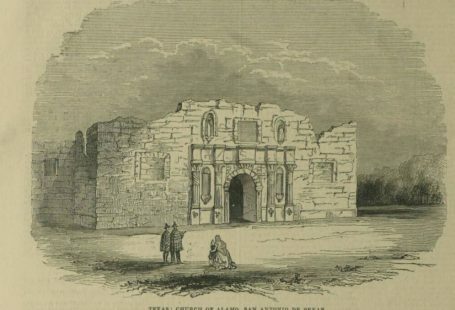 The British were supported by the Indian and Australian military, but the continuous attacks meant they never had time to recuperate and regroup their defence. 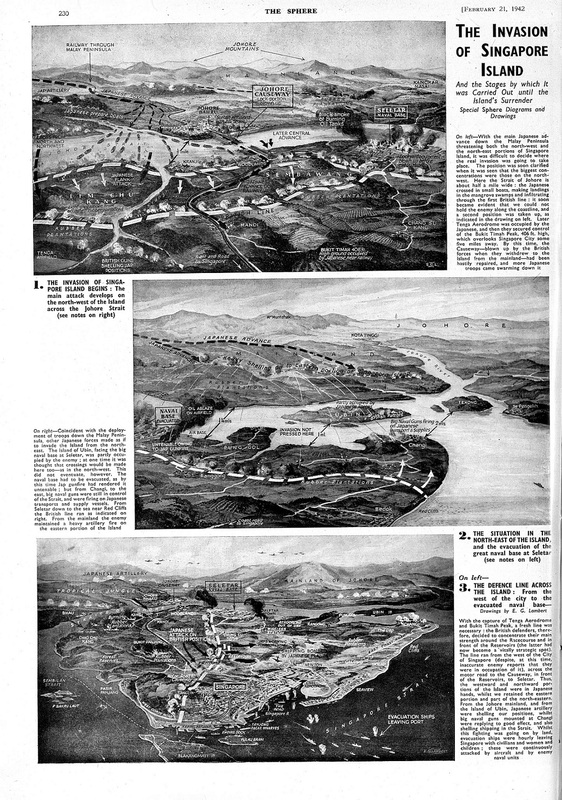 The Sphere published detailed diagrams and drawings of Singapore and exactly how the invasion transpired. The images show where the Japanese crossed the Strait of Johore and where the British retreated from the coastline and took up position across rubber plantations. A second image shows the situation from the north-east side of the island. A third image displays the defence line across the whole island. You can see the positions of the British and Japanese as well as the relentless bombing from Japanese aircraft. Around the coast are the numerous ships evacuating the ports. Evacuation of refugees from the island started from the end of January 1942. The British Newspaper Archive is filled with remarkable images and stories from evacuees. A large-scale evacuation of the island was never organised as it was always the intention of the British to fight for the island until the last moment. The Sphere and the Illustrated London News provides amazing illustrations and photographs of those final days on the island. Here, the Illustrated London News displays an image of a victim being removed from a wrecked building on a stretcher. You can also see that the military began to dig trenches on the island to plan for its defence. Thousands of residents and families of personnel fled the island by ship. 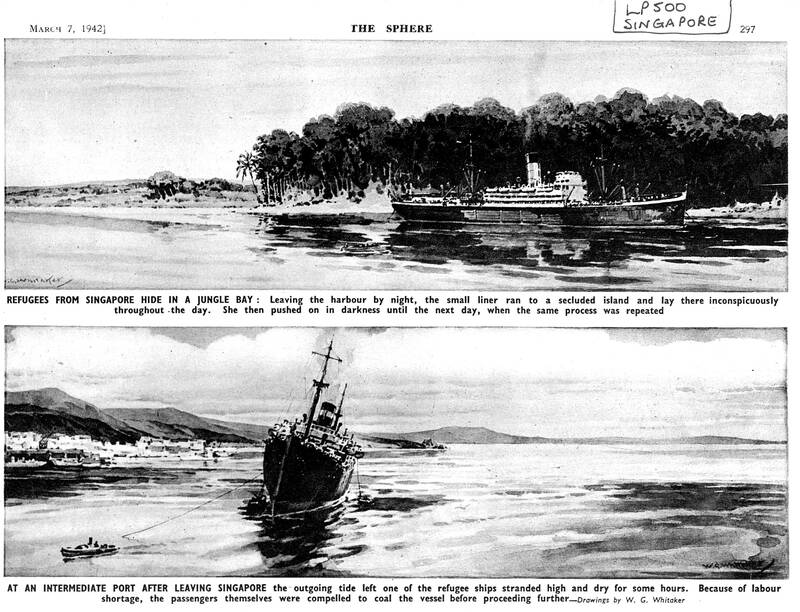 The Sphere published illustrations showing refugee ships leaving the island. Some ships that fled Singapore took shelter near the surrounding islands until nightfall before they continued to safety. This image shows a ship that ‘lay inconspicuously throughout the day’ in a jungle bay, waiting for the cover of night to push off. Another ship was left stranded by the outgoing tide and once they could proceed the lack of labour on board meant the passengers had to coal the vessel in order to continue the voyage. The ships took not only British employees and residents of the islands but also Japanese, Chinese, and Russian residents, to name a few. More than 8,000 people were evacuated from the beginning of February. Individuals were evacuated while the Japanese forces were moving further inwards on the island and enemy aircraft were zealously bombing the centre of the city. 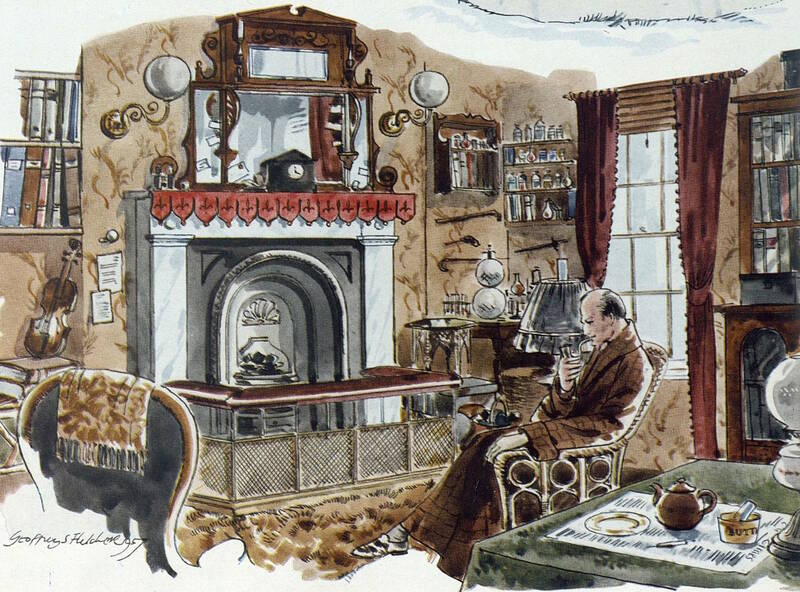 From the newspapers, you can recreate the scenes of ships full of refugees leaving the harbour amid the barrage of gunfire and sailing away from a blazing island. For many of those who were fortunate to board a ship, their journey had not finished. The ships then had to make their way to safety while avoiding bombs from above and oncoming Japanese vessels. Often, frightened passengers on board did not even know the destination of the ships. 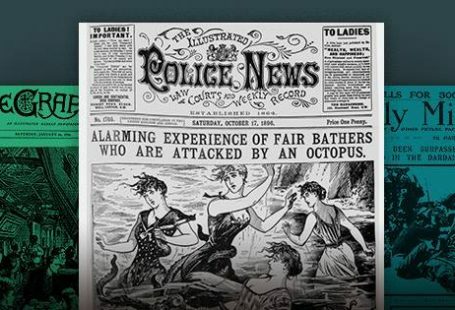 In some cases, ships full of women, children, nurses, soldiers, and supplies were sunk at sea after being attacked. In the days and weeks that followed the fall of Singapore, stories continued to be printed of courageous escapes. 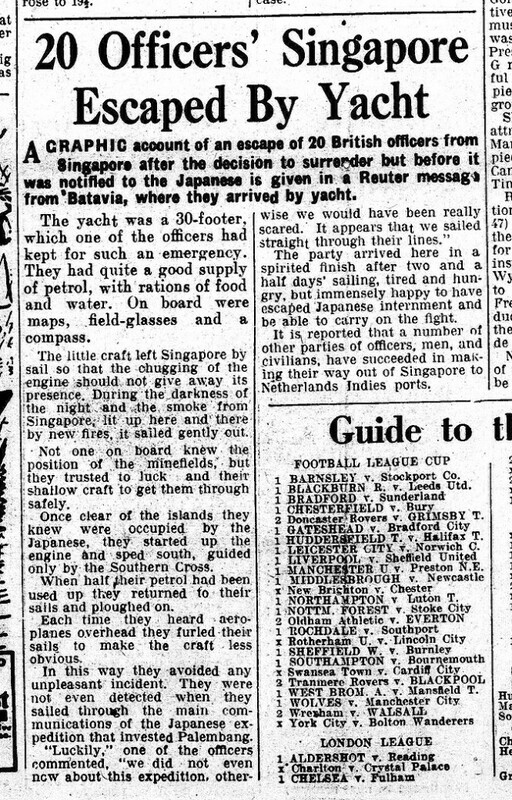 The Lincolnshire Echo reported the escape of 30 British officers on board a 30-foot yacht supplied with rations of food and water. The officers set sail during the night, blindly into a sea of mines, coasting away from Japanese-occupied islands. In order to conserve their limited petrol, they used the sails rather than the engine. 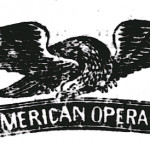 When an aircraft appeared, they furled the sails to avoid detection. 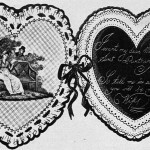 Two-and-a-half days later, they arrived in Batavia. The Scotsman printed a story of a Scottish woman and two European women who escaped Malay through Singapore by camouflaging themselves in the jungles. The ship they boarded sailed to South Africa first where 900 refugees disembarked. The ship continued to Britain with 600 refugees. 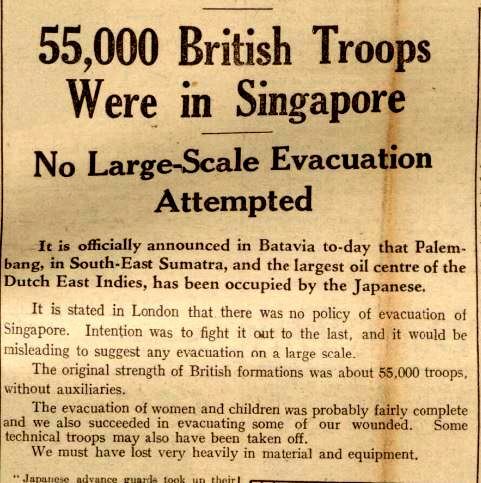 Once it was evident that Singapore would be lost, the papers began to ask questions. The Sunday Post broke down the military loss into 12 questions to better understand what happened, such as the following: Were there any surprise features in the [Japanese] attack? Could not Johore Straits have been thoroughly mined? Was it wise to defend the island? After the surrender of Singapore, the Japanese took nearly 100,000 prisoners of war. These prisoners had to spend the next three years suffering from neglect, disease, torture, and being overworked. 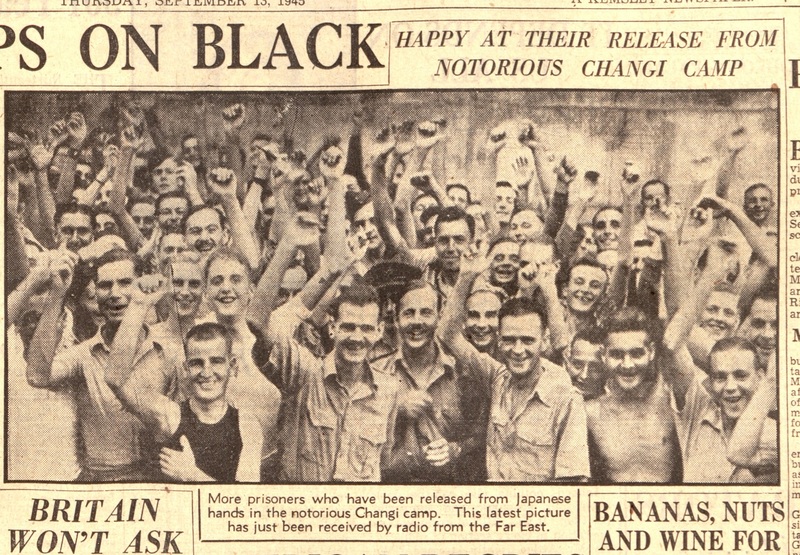 The Derby Daily Telegraph reported that morale was still high among the prisoners in September 1945. It reported that while British women were marched 10 miles to a Japanese prison, they sang ‘There’ll always be an England’ during the whole journey. However, the horrors of the life of prisoners did become evident. When the Second World War ended and the numerous Japanese prisoner camps were liberated the Red Cross arrived with supplies and medical help. The Sunderland Daily Echo and Shipping Gazette noted that out of 2,000 prisoners liberated, almost 80% were considered to be in critical condition according to the Red Cross. 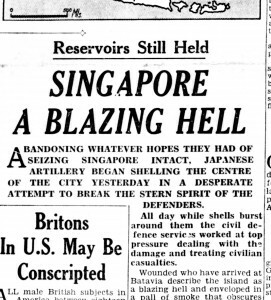 Even though 15 February 1942, the Fall of Singapore, is one of the British’s greatest military defeats, it is still a day of remberance and reflection for all of those who died during the Battle of Singapore and for those who endured years of imprisonment in the Japanese prison camps. My grandfather was part of the British during the battle of Singapore. Such a well written article, thanks so much. My grandparents actually told me they survived through the world war two and it was a horrific experience. Goes to show that we should not take things for granted. Thanks for posting this article to remind me of the important history.